Take a look at the AIDA Cruises success story. Here you can read about the company's history from 1994 up to the present day. AIDA Cruises expands its fleet by another ship in 2019. AIDAmira, the name of the future cruise ship, will be used for AIDA's Selection Programme. Nicole Langosch (34) takes over command of AIDAsol with immediate effect. This makes her the first woman in the position of captain in the AIDA fleet and the highest ranking woman on a cruise ship in Germany. In 2023, the market leader for cruises in Germany will put another ship of the latest generation into service. On 31 May, 2017, at 6:00 pm, one of the best-kept secrets of the Meyer shipyard in Papenburg was lifted: a spectacular graffiti surprise revealed the name of the first ship of the first generation that can run on LNG (liquefied natural gas) with nearly zero emissions. 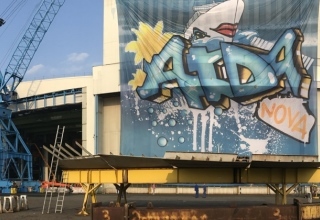 This name, AIDAnova, is now displayed on a graffiti banner in the construction halls where the ship is being built. On February 21, 2017, a new age dawned for the cruise shipping sector at the Meyer Werft shipyard in Papenburg. AIDA President Felix Eichhorn and Meyer Werft Director Bernard Meyer performed the symbolic first steel cutting for the world’s first cruise ship that can be run completely on liquid natural gas (LNG). AIDA Cruises is celebrating its anniversary: Twenty years ago today, on June 7, 1996, the first ship in the AIDA fleet was christened by former first lady Christiane Herzog in Rostock/Germany and put into service. From the very beginning, AIDA has stood for innovation and product diversity like no other company in the industry. Emma Schweiger christens AIDAprima on May 7, 2016 in the framework of the 827th HAMBURG PORT ANNIVERSARY. From April 30, the hanseatic city will be the start and end port for seven-day round trips to Western Europe's most beautiful metropolises such as London, Paris, Brussels, and Amsterdam. On March 14, 2016, AIDA Cruises took delivery of its first newbuild of a new ship generation from Mitsubishi Heavy Industries Ltd. (MHI) in Nagasaki during a formal ceremony. Felix Eichhorn (35), previously Senior Vice President Sales, Yield Management & Flight Operation AIDA Cruises, is appointed President of AIDA Cruises as of September 1, 2015, succeeding Michael Ungerer (49), who will assume new management responsibilities at Carnival as Chief Operations Officer Shared Services Carnival Asia. On the 8th of Oktober 2013 the name of the first ship of the new AIDA Generation, AIDAprima, is announced in Hamburg. AIDAstella was christened at a special ceremony held in Warnemünde on the evening of March 16, 2013. Michael Ungerer has been appointed President of AIDA Cruises. AIDAmar was inaugurated on the evening of May 12, 2012 with an extravaganza at the Port of Hamburg, accompanied by her three sister ships. A total of 1.4 million guests attended the Port of Hamburg’s 823rd anniversary celebrations. The Rostock cruise company AIDA Cruises announced today that it has signed a memorandum of agreement with Japan’s Mitsubishi Heavy Industries for the construction of two innovative new-generation Clubships. The 125,000-ton ships with 3,250 berths each will be delivered in March 2015 and March 2016. Christening of AIDAsol in Kiel under the heading: “Stars for AIDAsol: The AIDA Christening Night of the Proms. AIDA Cruises takes delivery of its fifth new vessel from the Meyer Werft shipyard in Papenburg. AIDA Cruises announces the ordering of the 10th AIDA ship. It will be built at the Meyer Werft shipyard in Papenburg, with delivery scheduled for 2013. AIDA Cruises takes delivery of its fourth new vessel from the Meyer Werft shipyard in Papenburg. AIDA welcomes its 2,000,000th guest. Captain Przemyslaw Kurc and Club Director Harald Bernberger welcome the Grob family on board AIDAluna. Christening of AIDAluna in Palma de Mallorca by top model Franziska Knuppe. AIDAblu laid down at the Meyer Werft shipyard in Papenburg. The fourth ship of the "Sphinx class" to be commissioned in spring 2010. AIDA Cruises welcomes its 1,500,000th guest. Captain Nico Berg and Club Director Klaus Grosse receive Jürgen Hinrichsen and his wife, Beate, on board AIDAaura in Hamburg. AIDAbella is christened in Warnemünde. AIDAluna is laid down at the Meyer Werft shipyard in Papenburg. AIDA Cruises orders two more new vessels from the Meyer Werft shipyard in Papenburg, with delivery schedules for 2011 and 2012 respectively. The AIDA fleet will then comprise nine ships. AIDAdiva is christened in Hamburg with a spectacular light show. After ordering a total of four newbuildings from the Meyer Shipyard in Papenburg, AIDA Cruises announces that the AIDAblu will be leaving the German market in the spring of 2007 and relocating to the affiliated company Ocean Village in Great Britain. The ship will be replaced by the first newbuilding which will be put into service in spring of 2007. AIDAbella, the second of the four new vessels, is laid down at the Meyer Werft shipyard. AIDA Cruises reaches the magical mark of one million passengers, with Karlheinz Zahm from Leonberg checking in on AIDAaura as the one millionth guest on 25 Aug 2006. AIDA Cruises is awarded certification in accordance with ISO 9001, ISO 14001 and OHSAS 18001, as well as the new industrial standard “GLC Social Responsibility”. They confirm the company’s compliance with the best international standards relating to quality, safety, environmental protection and social responsibility. AIDA Cruises places order for a fourth new ship, also to be built at the Meyer Werft shipyard in Papenburg for a cost of € 330 million. Delivery scheduled for spring 2010. AIDAcara celebrates her 10th birthday with a big party in Warnemünde together with all the staff from AIDA Cruises & its subsidiary companies. AIDAcara, the ship of the first AIDA generation, was christened on 7 June 1996 in Rostock/Germany. Laying down of AIDAdiva at the Meyer Werft shipyard in Papenburg and presentation of the relaunch of the brand with the new AIDA logo. AIDA Cruises opens its own agency in Vienna/Austria. The new AIDA office in the Danube metropolis strengthens the presence of AIDA Cruises in Austria. AIDA Cruises places an order for a third new vessel at the Meyer Werft shipyard in Papenburg at a cost of € 315 million. Delivery scheduled for spring 2008. Two new Clubship vessels built at the Meyer Werft shipyard in Papenburg at a cost of €630 million. AIDAaura as the German ship at the 2004 Olympic Games in Athens. Christening of AIDAaura in Warnemünde. Christening of AIDAvita in Warnemünde with Doris Schröder-Köpf, the wife of Federal Chancellor Gerhard Schröder, as the VIP Godmother. AIDA and Schmidts Tivoli GmbH found a joint company for onboard entertainment. Seelive Tivoli, today's AIDA Entertainment GmbH, hs its head office in Hamburg. The order for two further ships (AIDAvita/AIDAaura) for the AIDA line is awarded to Aker MTW in Wismar. Christening of the Clubship AIDA (now AIDAcara) in Warnemünde. Unterzeichnung des Bauvertrages für das Clubschiff AIDA (jetzt AIDAcara) mit der Kvaerner Masa Yards in Turku/Finnland.